Controversial: Watch The Video Of Allegedly Vote Buying By The Campaign Team Of Roxas! A video, which was originally posted by "KutangBato Vlogger" in Facebook, having Mar Roxas and his team as the topic is now circling online. The Uploader stated that the video was taken in Cotabato City. This was the rehearsal done by the team wherein the audience is instructed to shout loud based on the cheer given. According to the host of the event, the cheer "Oras na, Roxas na" should be heard loud and understandable or else they will not receive an envelope. 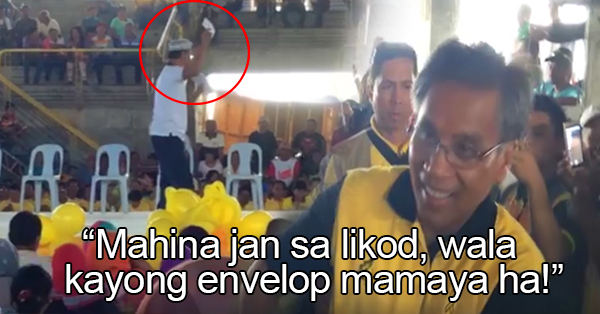 At the end of the video, the right time Roxas has arrived, the host was seen giving away two envelopes to two women who correctly answered the questions. When the netizens watched the recorded video, they concluded that it was indeed a practice of vote buying. However, the said action is yet to be validated.